Senior Hamas official says government's decision to freeze evacuation of Bedouin settlement is a "Palestinian victory." Ahmed Bahar, deputy chairman of the Palestinian Authority parliament and a senior member of the leadership of the Hamas terrorist organization, said on Sunday that Israel’s decision to postpone the evacuation of the illegal outpost of Khan Al-Ahmar is a "clear withdrawal by the occupation and victory for the Palestinian people." In a telephone conversation with the head of the Khan al-Ahmar council, Bahar said, according to the Ma’an news agency, that this decision by the Israeli government would not have been made had it not been for the steadfastness of the residents of the village, the support of the residents of the Gaza Strip, and the determination of the “Palestinian people” to thwart the demolition of the village by Israel. Bahar stressed that the "Palestinian people" are united in the face of the "occupation" and will not stop demanding that their legitimate rights, primarily freedom and self-determination, be realized. 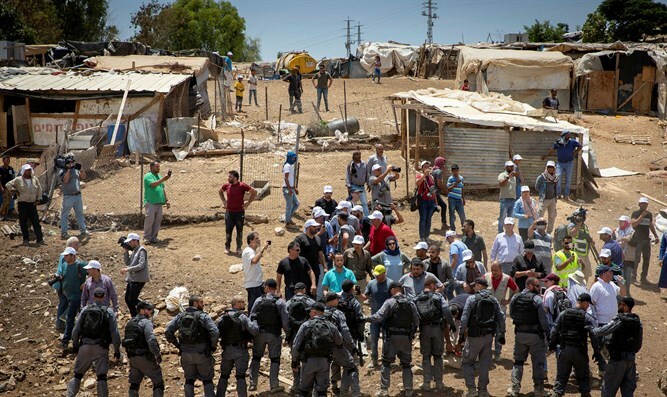 Earlier on Sunday, the security cabinet voted to approve Prime Minister Binyamin Netanyahu’s proposal that the planned demolition of the illegal Bedouin encampment east of Jerusalem be delayed for several weeks. Khan al-Ahmar, first established in the 1990s, is home to between 170 and 180 Bedouin who settled on a strip of land adjacent to the Israeli town of Kfar Adumim, east of Jerusalem. Following the vote in the cabinet, Netanyahu made clear on Sunday that the illegal outpost will be demolished. “Neither do I need fictitious ultimatums because we are all united around one goal – to evacuate this illegal construction. There is no argument about this. A 'fake' argument is being created. Khan al-Ahmar will be evacuated and very soon,” he stressed.